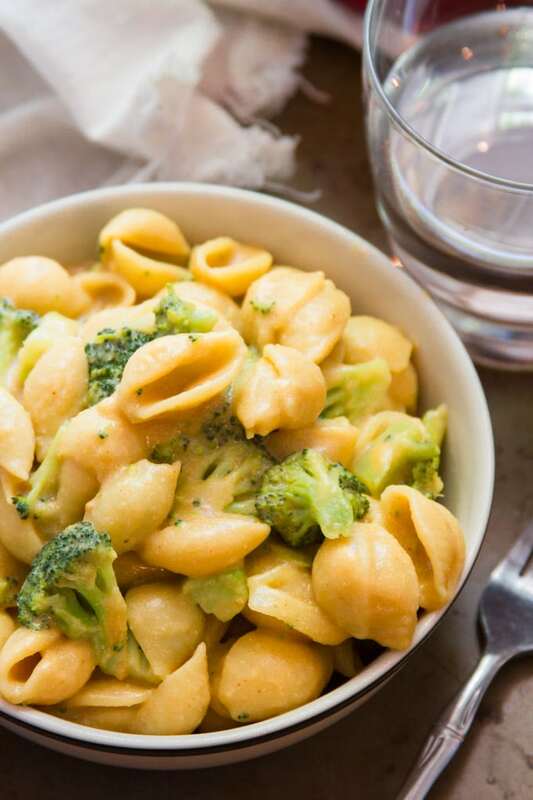 A vegan mac & cheese recipe that’s totally nut free! Coconut milk is the magic ingredient. Bonus: this creamy mac is super easy to whip up and requires no blending! This mac and cheese is not only vegan (and therefore suitable for people with dairy allergies too!) but it’s also nut free, and, if you like, soy free. Super allergy friendly. And bonus: it’s easy. You don’t even have to bust out the food processor. I adapted the sauce from my creamy pesto pasta, which uses coconut milk, but for this recipe I seasoned up the coconut sauce to taste cheesy. You’ll start by cooking some flour in a bit of oil. This is your thickener. Next, in goes a mix of coconut milk and another (not quite as rich) non dairy milk. You can use whatever non-dairy milk works with your diet here, as long as it’s unsweetened and unflavored. Soy milk, nut milk, rice milk, and hemp milk are all good choices. Let the sauce simmer for a while to thicken up. Seasonings go in at the end, to make it look and taste nice and cheesy. Maybe you noticed that I called this recipe “kid-friendly,” but also that it contains hot sauce. That’s not a mistake! Stick with a mild, vinegar-based hot sauce (like Cholula), and just use 2 tablespoons. Your mac will not be hot! The hot sauce will make it taste cheesier though. Trust me! To keep this recipe soy free, use coconut aminos instead of soy sauce.